Each year, Seven Seas Voyager spends the European summer months exploring the iconic ports and coastal towns of the Mediterranean. There are a number of cruises that depart from major Mediterranean ports of call including Rome, Venice and Barcelona, however you can also cruise from more obscure ports of call including Monte Carlo. Over the European winter months, Seven Seas Voyager migrates to explore other exotic areas of the globe. From November 2018, she will make her way across the Atlantic to cruise the Caribbean from Miami. Or, Seven Seas Voyager is due to visit our shores early in 2020. 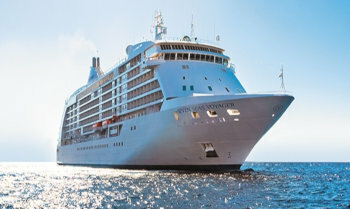 Making her way from the Mediterranean via Dubai and Singapore, Seven Seas Voyager will arrive in Sydney on 7 Jan 20 and will cruise via New Zealand back up into Asia, before heading to Sorrento to begin the 2020 Mediterranean cruising season. View all Seven Seas Voyager cruises or view more options for Regent Seven Seas cruises. Fresh from her complete and total refurbishment, Seven Seas Voyager now boasts a refreshed elegant style in her restaurants and lounges, as well as luxurious new decor across her 350 suites. And with 447 international crew on board, personal service is exceedingly indulgent throughout. Among her four dining options that allow guests to savour meals whenever and with whomever, Seven Seas Voyager features the modern French restaurant Chartreuse and the largest specialty restaurant at sea Compass Rose with its brand new menu. In addition to the elegant new decor, the ship offers five new production shows at the Constellation Theatre. Perfectly tiered for unobstructed viewing and furnished with plush seating, the main show lounge is an intimate venue without a bad seat in the house. The phenomenal variety of entertainment here includes full-scale musical revues and rousing cabaret shows by our nine-piece Regent Signature Orchestra. As the flagship restaurant aboard each of our ships, the wonderfully spacious Compass Rose serves breakfast, lunch and dinner and features an exceptional variety of European-inspired Continental cuisine, as well as flavorful vegetarian and kosher dishes and nutritious Canyon Ranch SpaClub specialties. Elegantly decorated in warm golden and maroon hues, Compass Rose delights with a beautifully refined atmosphere blessed with natural light during the day. Whenever you decide to whet your appetite, your Maitre D’ will guide you to a quiet, romantic table for two or a festive larger table – reservations are not necessary. A true classic in every sense, Prime 7 sets a new standard in steakhouse fare with its contemporary interpretation of an American favorite. Located on Deck 5, this restaurant is handsomely decorated with supple leather wing-back chairs, burnished woods and rich earth-toned fabrics, Prime 7 exudes a distinct, intimate elegance. This is glamour redefined, a luxurious setting to enjoy classic steakhouse cuisine with a modern flair. Prime 7 is open for dinner each evening, reservations are required. Preparing authentic, decadent French cuisine is an art form and is the raison d’etre of our French restaurant, Chartreuse. Capturing the diversity of French fare, our seasoned chefs offer an exquisite dining experience with tantalizing tastes and enticing presentation. Already a guest favorite on Seven Seas Explorer, Chartreuse is now a part of Seven Seas Voyager. Consequently, each and every dish served in Chartreuse is absolutely sublime and purely French. Each evening, La Veranda transforms into Sette Mari at La Veranda, a casual, intimate dining experience. Enjoy an extensive menu of authentic antipasti and Italian specialties served a la carte and paired with fine Italian wines – complimentary of course. Delectable dishes are prepared a la minute by our talented chefs using only the freshest gourmet ingredients and served by our attentive waiters. Sette Mari at La Veranda is open for dinner only.